We highly advise you to refrain from an application that goes by the name of TopSites Tab. This is important because our researchers have categorized it as one more potentially unwanted program that should not be active on your operating system. Such classification has been made because this piece of software acts in a rather invasive manner; it can, without any authorization, alter your web browser's default settings. Due to such functionality surfing, the web will become a much more bothersome and frustrating task. Another reason, this application has been dubbed as a potentially unwanted program is the fact that it could be distributed in devious ways. To learn more about the inner workings of this intrusive program, make sure to read the rest of our report as we present information gathered by our research team. Additionally, you will find a full removal guide that will help you delete TopSites Tab without encountering any problems. 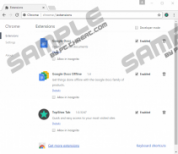 Unfortunately, some users could be manipulated into downloading and installing TopSites Tab since on its official website this potentially unwanted program is advertised as a great tool that should enhance your web surfing experience. While that sounds great, the reality is quite different. Once this dubious program successfully enters your operating system, it will immediately install a dubious third-party browser extension. Right after that is done, you will notice a change in your web browser's default settings. The main change induced by this devious program is of your new tab page. At first might not seem like a signification modification whatsoever but after a bit of time, you will notice that surfing the web the way you are used to will be almost impossible. That is so because every single time you will open a new tab page, you will not be presented with a blank page, but with a suspicious third-party website whether you like that or not. Unfortunately, the site does not provide any valuable features; in fact, its search box will make matters even worse since it can present you with a large list of sponsored third-party results that might have nothing in common with your original query. It goes without saying that there are no good reasons to keep this potentially unwanted program up and running on your PC. To delete TopSites Tab in a quick and easy manner, make sure to use the detailed instructions that we provide below. If you fail to terminate it, the undesirable change will continue to bother you. As it turns out TopSites Tab at the time is only compatible with the Google Chrome web browser. 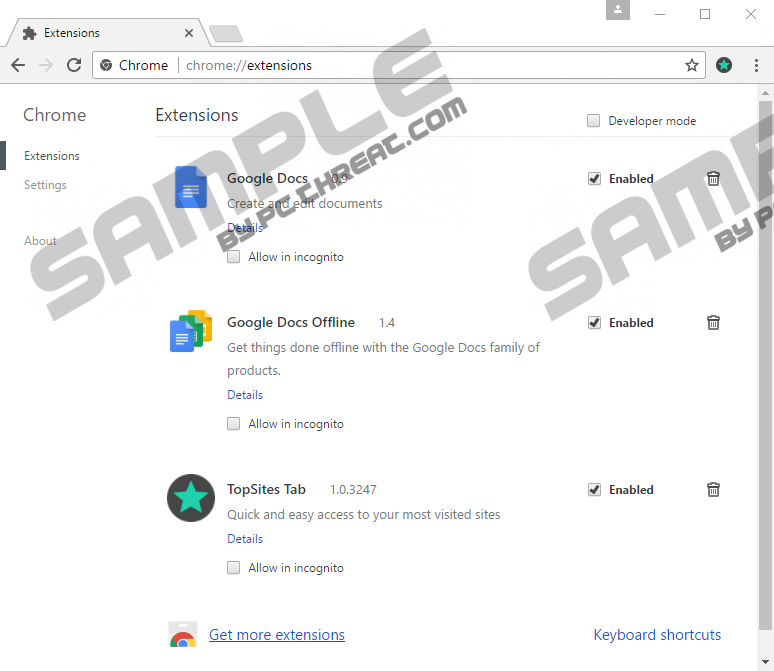 While this is the case, you should be aware of the fact that its developers could launch an updated version of this potentially unwanted program, which could affect other major browsers. Thus, being aware of its existence is critical. Keep in mind that in some instances this devious application might be spread via bundled installers, which are infamously used by malware developers to distribute their devious programs. To avoid such setup files, you must avoid all unauthorized third-party download websites and obtain all of your software from its official developer's websites only. Additionally, be sure to always learn as much as possible about every program you wish to have active on your PC before even downloading it. This is important because often cyber crooks use misleading marketing techniques to simply fool users into acquiring and installing a program without understanding how it functions. Finally, you best be to keep your computer safe and secure at all times is by having a professional antimalware tool active on your PC. Such a tool is the most important part of your overall virtual security because it can detect and delete any devious program automatically. These seemingly simple preventative steps will help you maintain a fully secure operating system at all times. It should be self-evident that the removal of TopSites Tab is essential if you wish to restore your web browser's default settings once and for all. Make sure to follow the instructions that we present below with care, and you will be able to delete this potentially unwanted program completely. We highly recommend double-checking your personal computer for anything associated with TopSites Tab once you are done with the instructions below. This way you will be sure that no traces linked to it are active on your PC. If you find manual analysis a bit too complicated, simply scan your computer with a professional antimalware tool since it can detect and delete anything related to TopSites Tab automatically. Right-click a folder entitled opamlohahgnnkjpdjjjgbgldemnaoaob and select Delete on. Right-click a folder entitled opamlohahgnnkjpdjjjgbgldemnaoaob and select Delete. Quick & tested solution for TopSites Tab removal.